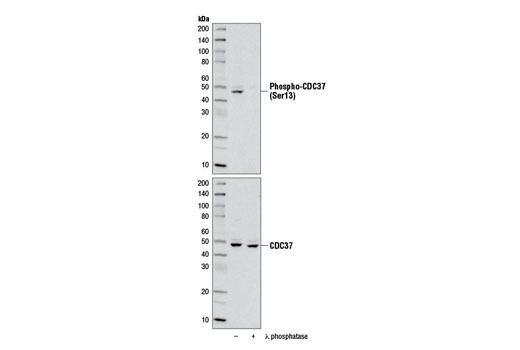 Western blot analysis of extracts from various cell lines using Phospho-CDC37 (Ser37) (D8P8F) Rabbit mAb. Western blot analysis of extracts from 293 cells, untreated (-) or treated with λ phosphatase (+), using Phospho-CDC37 (Ser13) (D8P8F) Rabbit mAb (upper) and CDC37 (D11A3) XP® Rabbit mAb #4793 (lower). 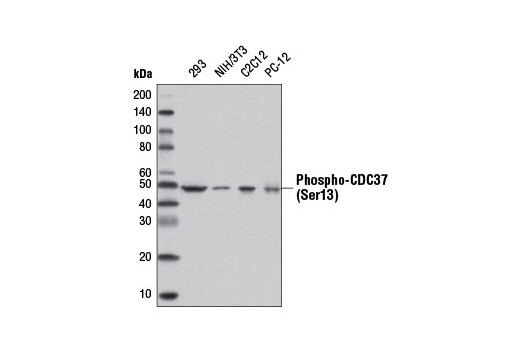 Phospho-CDC37 (Ser13) (D8P8F) Rabbit mAb recognizes endogenous levels of CDC37 protein only when phosphorylated at Ser13. Monoclonal antibody is produced by immunizing animals with a synthetic phosphopeptide corresponding to residues surrounding Ser13 of human CDC37 protein. CDC37 is an important component of the HSP90 chaperone complex (1,2). It was initially identified for its involvement in cell-cycle progression and was later found to have a much broader role as a chaperone for a wide variety of kinases and other proteins (1-3). CDC37 protein has an amino-terminal kinase binding domain followed by a central HSP90 binding domain. It recruits and stabilizes kinases in the HSP90 complex by protecting the newly synthesized kinase peptide chain from degradation and promoting the next step of protein maturation (4,5). CDC37 also suppresses the ATPase activity of HSP90, thereby leading to conformational changes in the complex that preclude target kinase loading (6). CDC37 has been proposed as a therapeutic target because of its important role in multiple kinase pathways involved in proliferation and cancer cell survival, including Raf, Akt, Src, and ErbB2 pathways (7,8). CDC37 is phosphorylated by CKII at its carboxy-terminal Ser13 residue; this phosphorylation is required for its interaction with HSP90 and target protein stabilization function (9,10). Karnitz, L.M. and Felts, S.J. (2007) Sci STKE 2007, pe22. Caplan, A.J. et al. (2007) Trends Cell Biol 17, 87-92. Caplan, A.J. et al. (2007) Cell Cycle 6, 3145-7. Mandal, A.K. et al. (2007) J Cell Biol 176, 319-28. Lee, P. et al. (2002) J Cell Biol 159, 1051-9. Siligardi, G. et al. (2002) J Biol Chem 277, 20151-9. Kimura, Y. et al. (1997) Genes Dev 11, 1775-85. Gray, P.J. et al. (2008) Nat Rev Cancer 8, 491-5. Shao, J. et al. (2003) J Biol Chem 278, 38117-20. Miyata, Y. and Nishida, E. (2004) Mol Cell Biol 24, 4065-74.